I like the cloth texture and the color and the best part it goes with my sofa set.The shipment arrived well in time and was in perfect condition no damage.i will recommend this to my friends and family. Lounge about like royalty in your own home with this posh and luxurious chaise lounge. Featuring an arm on one side and extra plush, tufted buttoning throughout, this lounge has it all. You can relax knowing that this lounge is not only stylish but comfortable as well, so comfortable in fact you wont even notice that you fell asleep during a lazy Saturday afternoon reading your favorite book or watching your favorite movie. The chair itself is sturdy &amp; comfortable. Super easy to assemble. However, I ordered the “dark charcoal” which, as you can see in the pic, looks closer to black. I was pleased thinking it would be a lighter black. What I received was neither black or charcoal (in my opinion). It looks more blue to me than anything. Maybe bluish grey. This is a Christmas gift, which is a week away, and my daughters room is black &amp; white. This “blue” is going to look terrible in there. My heart broke when I opened this package. I've always like the idea of a chaise lounge and the blue fabric shown in the picture is accurate. The tufted look with buttons is a nice addition and is comfortable. I would definitely recommend it for a medium or larger size room with other furniture. I love this super comfortable lounge. Great Chaise Lounge, easy assembly and very comfortable. Very beautiful and comfortable Lounge ! I love my purchase! This chaise lounge is well made, very comfortable, easy to put together, sturdy, and adds a touch of elegance to my living room. I am already receiving compliments on it. Highly recommended! I like the feel of the fabric, but the color is not even close to the picture shown. I ordered the blue grey, but in actuality it's more just grey. This is a known challenge when ordering something online and sample picture always looks good. This is a sturdy, nice looking piece of furniture. I love the charcoal color, it is firm yet very comfortable, perfect for lounging around. It looks fancy in my leaving room. I was surprised they delivered it so fast! Thank you Overstock for offering nice furniture at affordable price and free shipping. I was looking to create a reading corner with this Chase. It came exactly as shown and described. Great quality and very easy to put together. I wouldn't hesitate to buy this again. This was a gift and it is perfect for me to lie on and read. Comfortable, color looks great in my room and the fabric is beautiful. It is holding up well. I like the piece, but it doesn’t look as nice as it does in the photo. It still looks nice but not as expensive-looking as I had hoped. The color is also off, it is a grey-based beige. Not as warm toned as pictured. The cushion is firm but has a nice spring! Look forward to seeing how it holds up with use. Item arrived sooner than expected. Very easy to put together. Fabric was exactly the color shown on line when ordering. Easy to assemble, fast shipping, lovely addition to our living room! OMG, this a beautiful addition to our living room. Very easy to install, I definitely recommend this chaise. Love this! The quality is great! Looks expensive. Looks great in my daughters room. Very pleased. Fabric is very nice, color as pictured. Not crazy about the finish on the legs, will paint them black. This chaise isn't comfortable. I put it together, which was easy, but the cushions are hard, and there is a dip in the padding. It'll be fine to sit on, but forget laying on it. Also, the color in the photo is much lighter than the actual product. In person, it's more of a denim color. My boyfriend confirmed it looked way darker than the photos, so it's not just me that thinks this. My experience ordering this product was difficult, honestly. When I ordered, the confirmation email said it would arrive by December 3rd. It didn't come until December 11th (ordered Nov 27th). When I called customer service to ask about it, they couldn't even track the package down to see where it was. I finally got a tracking number weeks after ordering, but the person on the phone said she had no idea where the chaise was. She offered to cancel the order and reorder it, but I had lost trust in the process at that point. 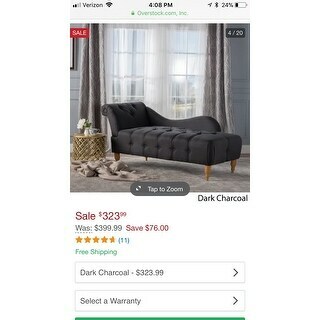 I'd return the chaise but I need it because I have guests this weekend (i had donated my furniture after ordering this piece and a couch from Crate and Barrel). The stress of not having a couch for my guests was not worth what I ended up receiving. I would have been fine if the expected delivery date and tracking number were more realistic. Don't promise a week and then take over 2 weeks. easy to put together and looks good. Literally once it's out of the box, it takes 5 minutes to assemble. Easy to put together by yourself which was a bonus. Love the dark charcoal color blends well with other décor in reading nook. Chaise does not show pet hair. Easy to clean. Comfortable with throw pillows. The lounge is perfect for extra sleeping in the master bedroom at out beach codo. Color is good and the product is sturdy. Great place to escape the mob for quiet reading. Overall, chaise looks great! I purchased it in the dark grey color and it looks more of a deep grey-blue in person. It arrived in a few pieces and was easy to assemble. The legs seem to be wood but are coated with a yellow tone, appearing more plastic. They are screw on and come with leveling disks. The predrilled holes were predominantly straight, but one is a little crooked, making the leg look bent. For the price though, it adds an elegant touch to my living room and I’m happy with it. 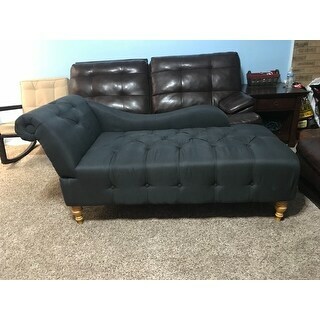 The chaise looks beautiful, but I haven't quite figured out how to secure the back and side to the base? "Are there flame retardant chemicals in this couch? " Most of our items are flame retardant. "I ordered this item and the arm doesnt fit tightly into the base. Is it supposed to "click" into the base? Has anyone else had this problem? It is loose and this is the second one I have received. " Insert the small metal arm firmly but gently and push the chaise arm (C) downwards until it is fully slotted and locked into position on the sides of the prefabricated slide lock gadget on the assembled chaise base (B) and metal sleeve of the chaise backrest (A) as shown. If this does not work, please contact customer service at this link https://help.overstock.com/app/contact_page for immediate assistance with this issue. No, it should not be loose. You do have to align it and use some pressure to slide it down and slightly forward. It does not "click" but "locks" into place. I had a friend insert it as I was having the same trouble. It is the same motion used to insert the arms or back on a recliner. "Is the arm on the left side when you are sitting in the chair or looking at the chair? I need a chair in a very small siting area so I need to make sure the right side should be open when I am sitting in the chair. Thank you." The arm is on the right side. "Which side is the arm on? (I see above that someone said "left," but is this in relationship to someone sitting in the chair or looking at the chair?)" "Which side is the arm on?" Left. This is very well made, easy to assemble and comfy. It looks elegance and fit color my interior. I love it. "Can the arm of this chaise be on either side?" The only option is the color. 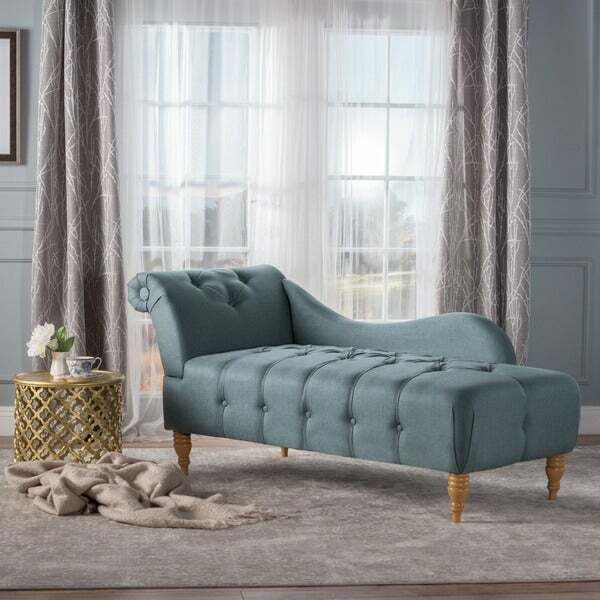 Safavieh Mid-Century Modern Caiden Velvet Grey Chaise With Pillow - 63" x 27.5" x 30"
Safavieh Mid-Century Modern Caiden Velvet Navy Chaise With Pillow - 63" x 27.5" x 30"